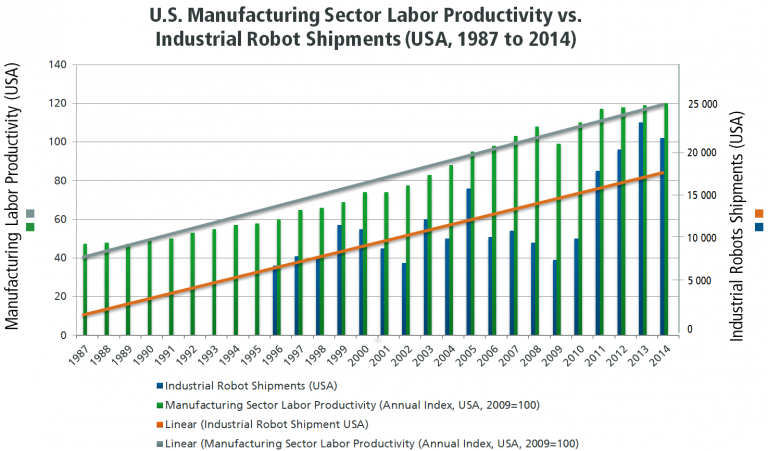 Industrial robotics is changing the U.S. manufacturing industry portrait. The Association for Advancing Automation recently published a white paper discussing the impact of industrial robotics on productivity and employment in the manufacturing industry. We would like to share our thoughts about its main findings. Figure 1 below illustrates the evolution of robot shipments and employment for almost 20 years. The relationship between those two is clearly visible. 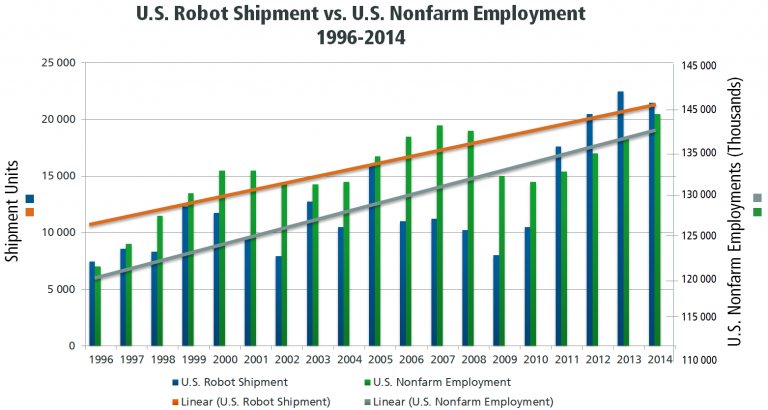 As the robot shipments slowed down (blue bars), like in 2001-2002 and 2007-2010, so did nonfarm employment (green bars). The industrial robot shipments are linked with the growth in manufacturing labor productivity, as it can be seen in figure 2. Again, the drop in robot shipments in 2007-2010 (blue bars) correlates with the loss in productivity, mainly in 2009 (green bars). We can also see from figure 2 that both measures seem to grow in the long run at a similar pace (orange and grey lines). Clearly, industrial robotics is changing the U.S. manufacturing industry portrait, stimulating companies to bring back activity in the country. From 1979 to 2009, thanks to the low wages in developed countries, many companies moved manufacturing activities offshore. The very low wages and the moderate transport costs made this move profitable. But the picture has been changing for the past years. 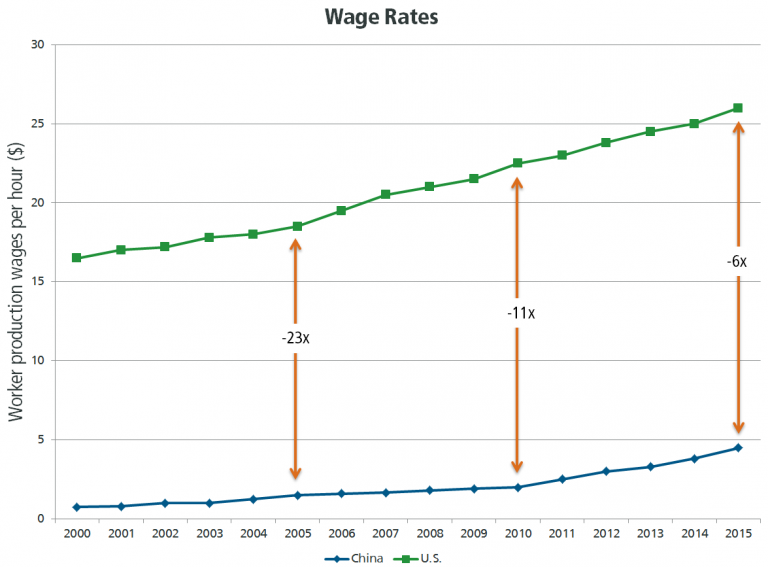 Since 2000, the wage rate between the U.S. and China was roughly divided by 4 (figure 3). 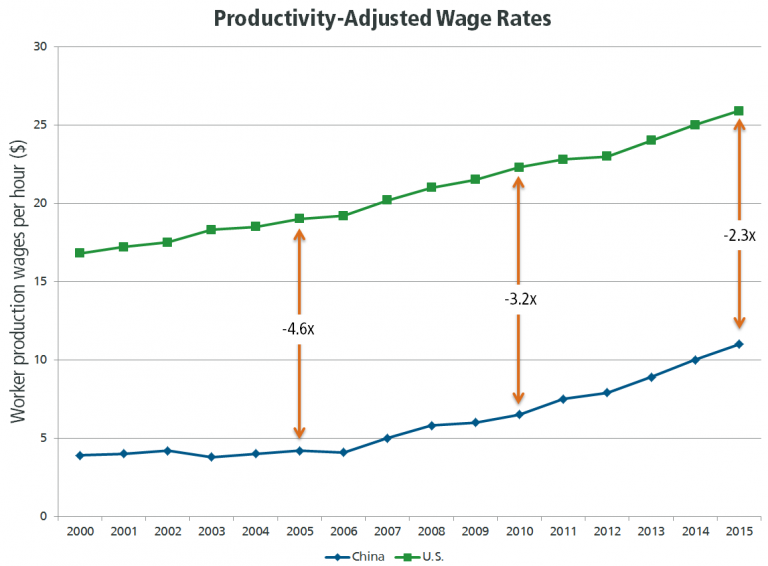 It makes sense to consider the increase adoption of automation technologies for the same time period to have made an impact in productivity, therefore cutting by half the gap in the worker production wages per hour for the same time period (figure 4). Many U.S. manufacturers, after investing in fabrication technology, managed to grow their businesses and, in the long run, increased their workforce. Over the past decades, the number of Americans with less than high school degree has been seriously declining. The number with a bachelor degree or higher also increased significantly. This skilled workforce is looking for value-added jobs. The integration of technologies on the plant floor will make manufacturing jobs more appealing for this new workforce. Of course, a large amount of this skilled personnel now works in the service industry, but a significant amount of STEM (science, technology, engineering & math) graduates consider the manufacturing industry for their career path. So, does robotics and automation cut or create jobs? We’ll all agree that those technologies create a shift in the workforce. According to a report produced by Deloitte, U.S. manufacturers will need 3.4 million new employees for the next decade, while there is only 1.4 million workers with the adequate qualification available. This gap needs to be filled, and automation and robotics can provide part of the solution. If the manufacturers cannot get their products out the door, they will have to close. Therefore, technology will help the manufacturing industry keep the plant running, avoiding the loss of many great jobs. Axium is a leading provider of factory and warehouse automation solutions in a wide variety of industries. Recognized throughout the industry for its innovative designs and expertise, Axium is proud to deliver integrated solutions that yield performance, efficiency and reliability. Axium’s strength is its people. Having installed more than 500 robotic assembly and material handling projects throughout North America and around the world over the last 20 years, Axium’s team has acquired the knowledge and experience necessary to engineer and deliver complex turnkey automation projects.